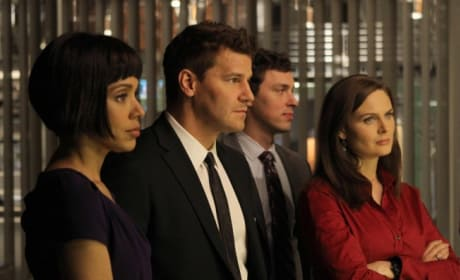 Cam, Booth and Brennan in a photo from "The Ghost in the Machine." Bones' 150th episode airs December 3, 2012. Angela and Brennan in a photo from "The Ghost in the Machine." Bones' 150th episode airs December 3, 2012. Cyndi Lauper and Angela in "The Ghost in the Machine." Bones' 150th episode airs December 3, 2012. 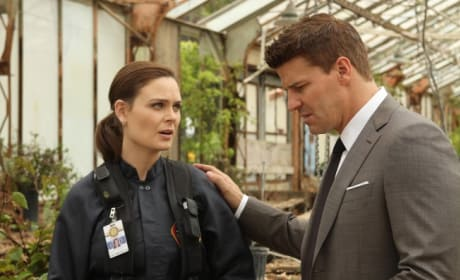 Booth and Brennan in a photo from "The Ghost in the Machine." Bones' 150th episode airs December 3, 2012. 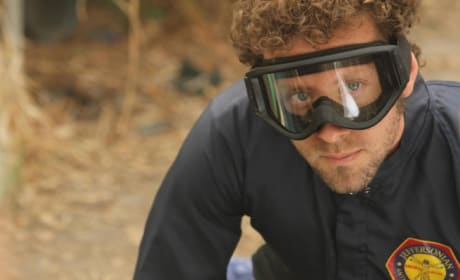 Hodgins up close and personal in "The Ghost in the Machine." Bones' 150th episode airs December 3, 2012. Cyndi Lauper on Bones' 150th episode, "The Ghost in the Machine." Look for it December 3, 2012.